So this past weekend, my Bountiful Baskets experience was reasonably miserable. I woke up to an email that the truck was going to be late (I don't recall how late now), so I mentally adjusted my busy, busy day. Then another email. And another. And the truck was still an hour later than the emails told me. Dale, naturally, asked me if this is really worth it. I told him I think it is, and this kind of thing (to this extreme) is not the usual. But it is frustrating. So why do I do this? I get more produce for the dollar than I could get if I went shopping myself. This week, for instance, I priced out my per-basket cost, and my $15 basket would have cost $26.34 at Safeway. So I got an extra $11 worth of produce. Times 3 baskets. Roughly $80 of produce for $46.50. This is actually the lowest value I've ever had when I priced them out. I've budgeted for my Bountiful Baskets contribution each week. That means that I know absolutely that I will be getting fresh produce into my house. If I were going into the store with just a general grocery budget, I'd look at the prices and freak. I'd buy potatoes, onions, and occasionally a bunch of bananas or a bag of apples. Occasionally, I'd buy lettuce (not lately though). But that's it. Bountiful Baskets means that my family has a variety of vegetables, and we can eat fresh fruit almost every day. Usually multiple servings. I could never afford this otherwise. My children are learning to like a huge variety of fruits and veggies. Brussels sprouts? I never would have bought them, and now they are a family favorite. I'm preserving some for our more long-term storage. Tomatoes, salsa, apple/pomegranate mix, peppers, onions, carrrots, canned pears, pickled spicy veggies, pickles, to name a few... we're able to store up the excess. I love the people I've met at Bountiful Baskets. Love 'em. I've learned about a bunch of other great things through the people I've met at Bountiful Baskets. Like Zaycon Foods. Through Zaycon, I bought 80 pounds of fabulous chicken breasts at a good price. The "I have no idea what we're going to get" factor is fun. Some weeks, like this past one, the basket is filled with fairly normal, staple-types of produce. Potatoes, onions, celery, green peppers -- how much more "normal" can you get for veggies? Nothing in this basket really requires much thought from me. Some baskets force me to be more creative. I like that. Because if I was spending money individually, I'd never try some of these things. I was already pretty good at using up whatever we had around. Bountiful Baskets brought that to a whole new level. When I started doing the baskets, I would invariably end up tossing out a few things at the end of the two weeks (and that was with getting 1-2 baskets every second week). Now, I get 1-2 baskets (or three this past weekend) nearly every weekend, and I rarely have to toss things. I feel more a part of my community since Bountiful Baskets came out onto the plains than I ever used to. So yeah. The late truck thing is incredibly frustrating. But I'm sticking with it. You just listed a lot of reasons I miss my Farm Fresh to you Box and wish that Bountiful Baskets would come to California! Grammy -- I know, we wait because we have to. But our B weeks have been so incredibly unreliable. Four hours late this week. At least I had the ability to change my day around. That isn't always the case. Great post! I love our baskets too. My closest Bountiful Baskets is 45 minutes away, but I am thinking especially pre season it would be VERY worth it. We do gleaners during the harvest season and try to grow our own stuff as well but winter and early spring are harder. Cariann - when I started, the closest location was just over an hour away. Then we got one out east, so it was about 45 minutes, which made a huge difference! Now, I have one a mere 20 minutes away. Love that. I did a FSA share that first year, but they closed down. :( now that BB is in Colorado every week, though, I do pretty well through there. If another convenient option came up, I'd look into it. But I'm way happy with Bountiful Baskets. I wish we had something like this! I agree with you on all of this. If I go to the grocery store I just end up staring at everything unsure of what to spend my money on. I'll get some apples and that's it. 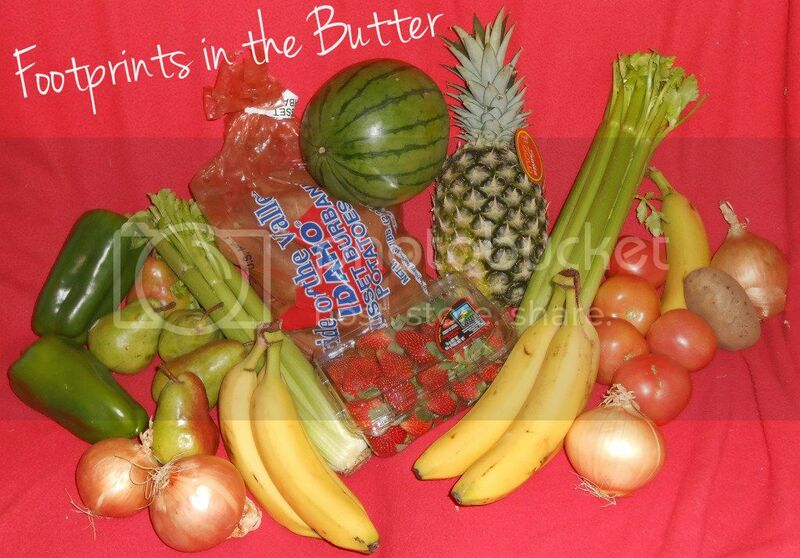 Bountiful Baskets has made it possible to eat healthy. It's just my husband and I so we get one basket every two weeks and it's plenty for us. I love that it has introduced new foods to us that we now love. Cooking is fun with Bountiful Baskets! And the savings? So worth it! still jealous. maybe even more so. so wish we had Bountiful Baskets here! I hope you'll link this up on Thursday with Frugal Family 2013! My basket priced out at $32 this week so it was like the steal of the year.